With technology changing so rapidly, how can libraries, organizations, and individuals stay abreast of the economic, social, and ethical ramifications of innovations and prepare successfully for the future? Inspired by a Massive Open Online Course (MOOC) on the future of the information profession that was offered by the San José State University (SJSU) School of Information last fall, Dr. Sandra Hirsh, director of the SJSU School of Information, and Steve Hargadon, founder of The Learning Revolution, have worked with Dr. Sue Alman to develop the Library 2.015 Spring Summit—The Emerging Future: Technology and Learning to address this very question. The free half-day seminar is open to the public and will take place online via Blackboard Collaborate on April 30, 2015, from 12 p.m. to 3 p.m. PDT. Dr. Alman, the SJSU lecturer who developed the Emerging Future: Technology Issues and Trends MOOC, said that the Library 2.015 Spring Summit was conceived because “monitoring technology is vital for educators and information professionals.” The MOOC had a massive global reach, but “there is a need to continue to prepare for the emerging future,” stated Alman. The spring summit will address this need by providing access to the many online resources explored in the MOOC, as well as presenting an overview of the changing landscape of the information field and creating “a forum to connect to a larger community,” explained Alman. The Library 2.015 Spring Summit will be divided into three hours, with opening and closing keynote panels and one hour of quick topic presentations. In Part 1, Chasing Storms or Rainbows?, a keynote panel will look at the effects of emerging technologies on current and future learning trends. Part 2, In the Know, will feature three short sequential presentations: how to plan and fund new technologies; how to stay up to date with new technologies; and a drill down on the key impact areas of new technologies. Part 3, The Here and Now, will be a closing panel discussion on technology and social media trends. According to Library 2.0 event co-chairs Hirsh and Hargadon, the goal of the Spring Summit is “to provide a forum to learn about and discuss ways to prepare for the future, both professionally and organizationally.” The spring summit is new this year and complements the annual Library 2.0 conference, which will be held entirely online on October 20, 2015. More information about the Library 2.015 events, including the Library 2.015 Spring Summit, the Library 2.015 webinar series, and the Library 2.015 Worldwide Virtual Conference, is available on the Library 2.0 website. The event is held entirely online, open to the public, and free to attend (registration required). 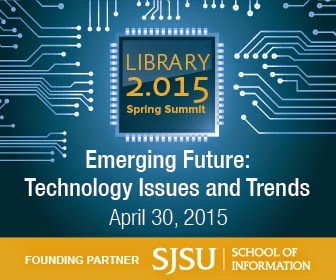 Please register at http://library2015spring.eventbrite.com/?aff=lib20.